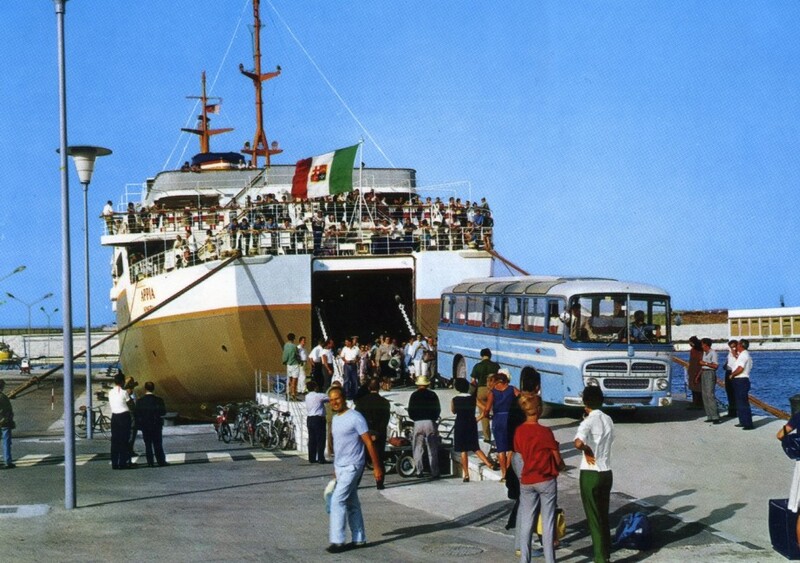 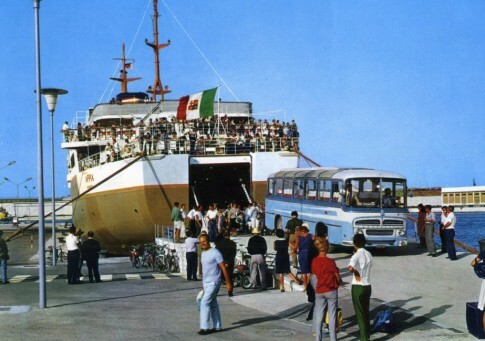 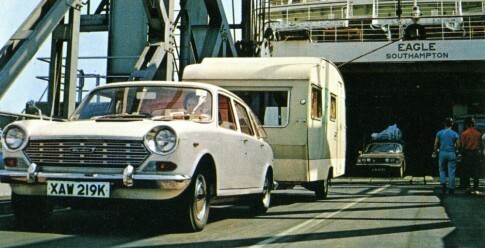 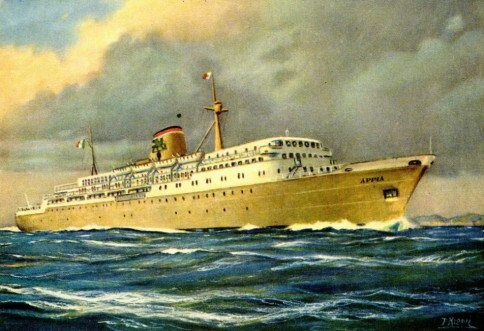 The Appia of 1961 was the first car ferry of the Italian state-controlled operator Adriatica. She joined the equally new Greek (Hellenic Mediterranean Lines)-owned Egnatia on a ground-breaking joint service from Brindisi to Corfu, Igoumenitsa and Patras, the Adriatic’s first proper car ferry operation. 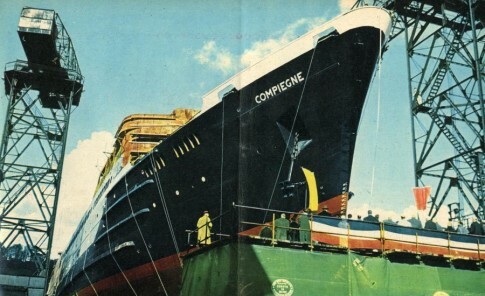 The ships, which proved a great success, took their names from the two Roman roads which, on their respective sides of the sea, connected Rome with Constantinople (Istanbul). 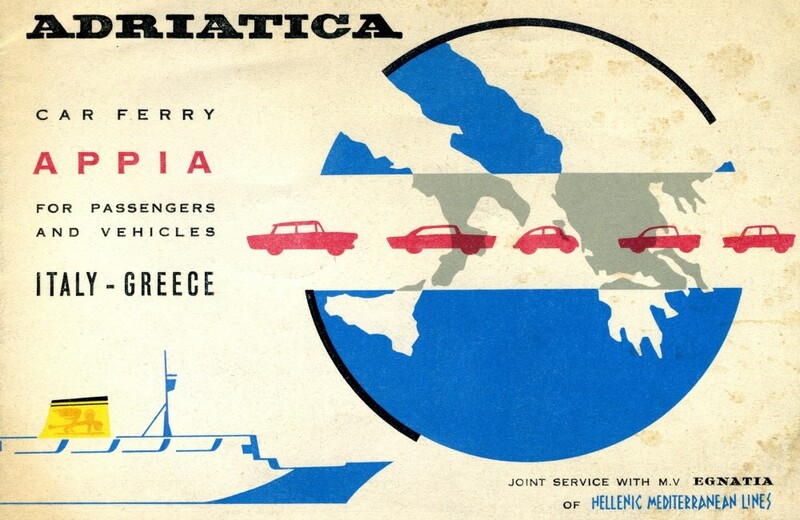 We will return to the Egnatia and HML at a later date – unlike their Greek counterparts, Adriatica still exists, in a much denuded form, as a small and seemingly unwanted division of Tirrenia. 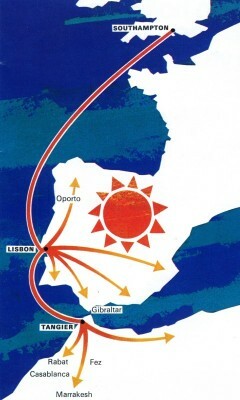 The failure of either operator to properly build on the early success of the Egnatia and Appia has to be viewed as something of a tragedy given the possibilities that existed in the Adriatic market, as exemplified today by the modern and heretofore broadly profitable services of relative newcomers like Minoan Lines, ANEK and Superfast. 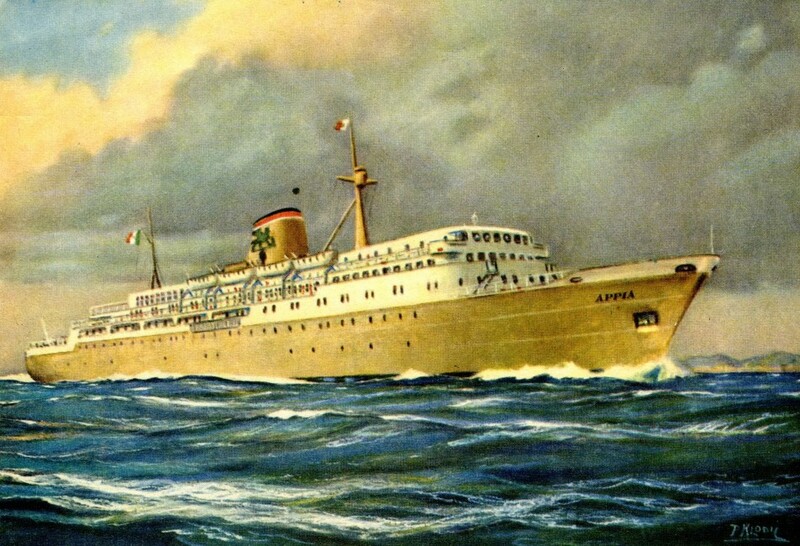 The Appia was as far removed as can be imagined from the current speedy leviathans yet, at her introduction, she was fairly revolutionary – Italy’s first drive-on international car ferry. 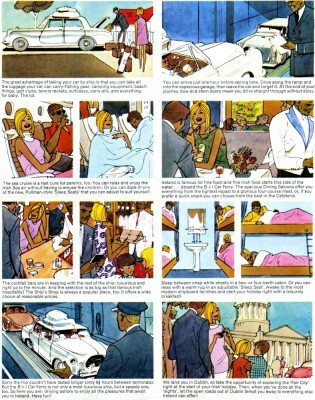 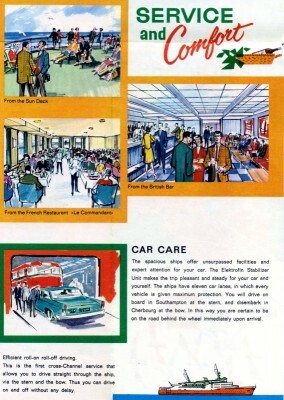 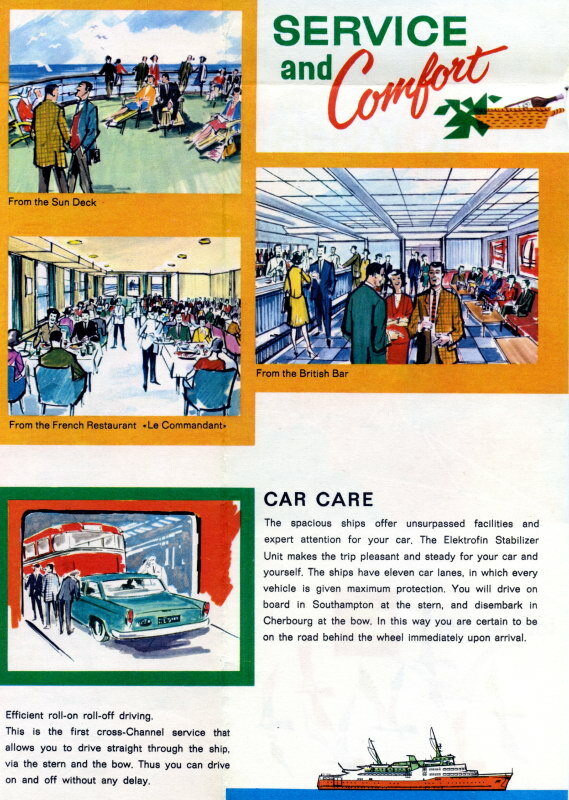 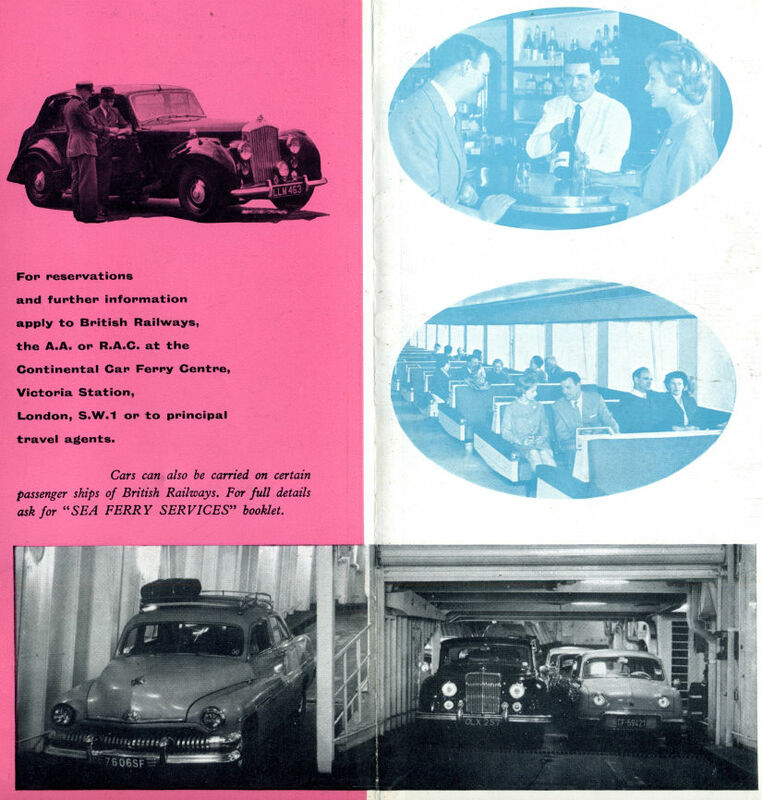 Her inaugural brochure proclaims “a new, comfortable and fast means of conveyance; she is the answer to the requirements of modern tourism, of which motoring is so great a part. The crossing between Brindisi and the west coast of Greece takes approximately eight hours and can be made in comfort at remarkably little expense. 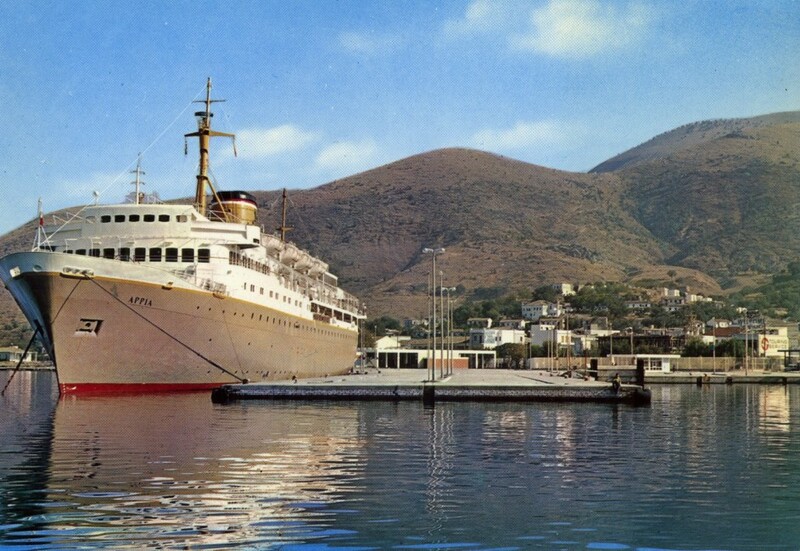 “If desired the crossing can be extended to take in the sea trip between Igoumenitsa and Patras – this trip, always made in daylight hours, is of the greatest interest, the island scenery being unfailingly beautiful”. 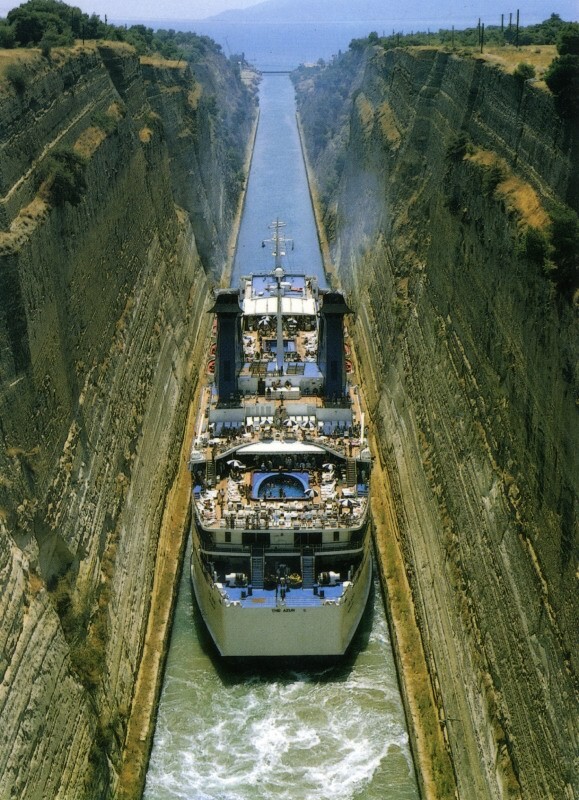 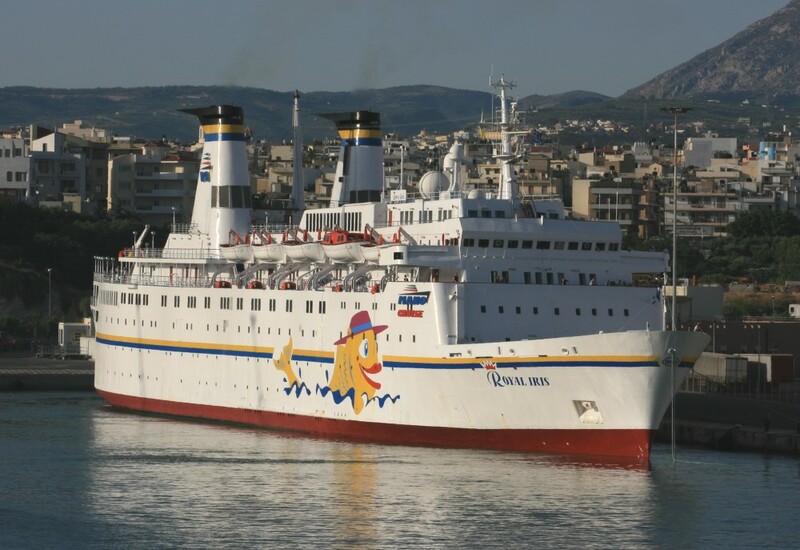 The ship in size and speed seems quite puny now – her two Fiat diesel engines providing a 17 knot service speed which powered her 706 overnight passengers on the 19 and a half hour (with a following wind) through crossing to Patras. 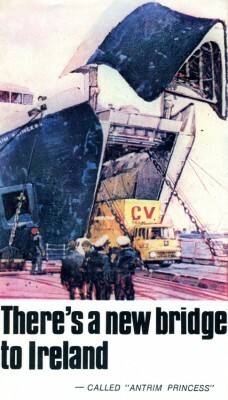 ... and the real thing as delivered. 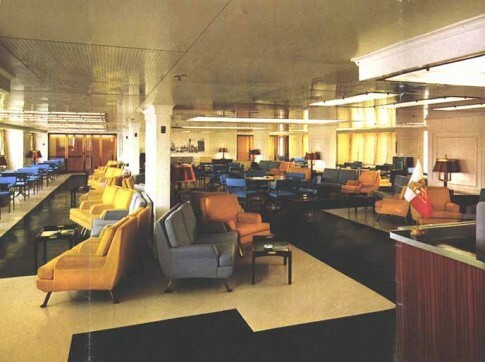 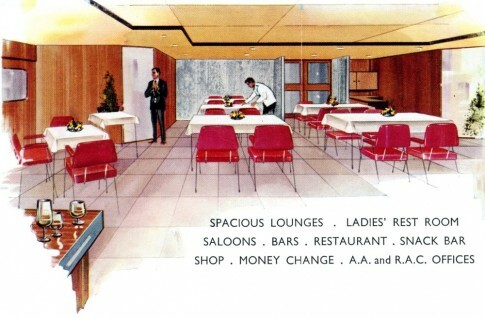 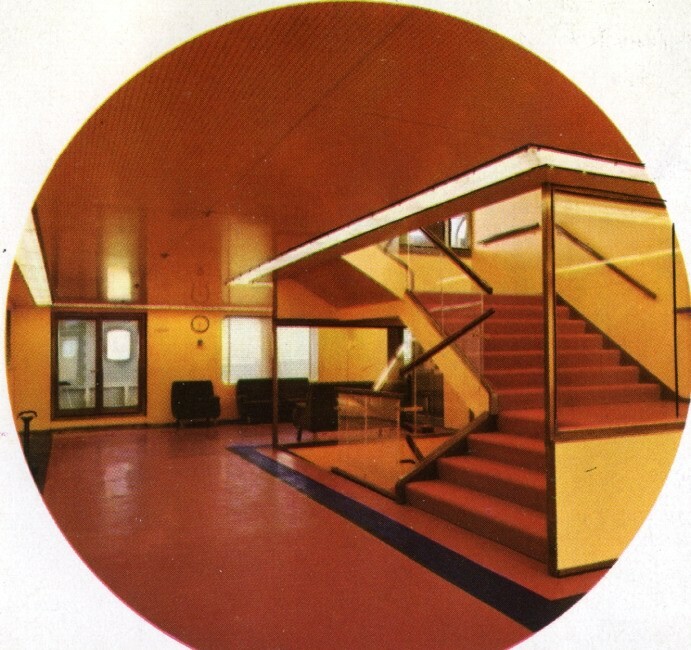 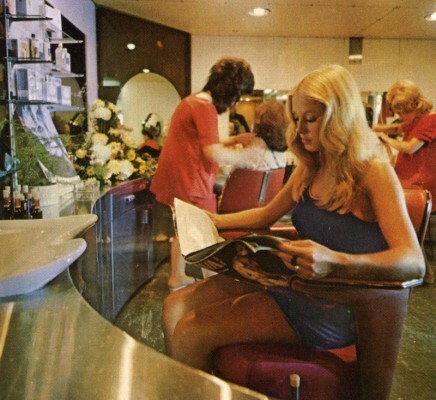 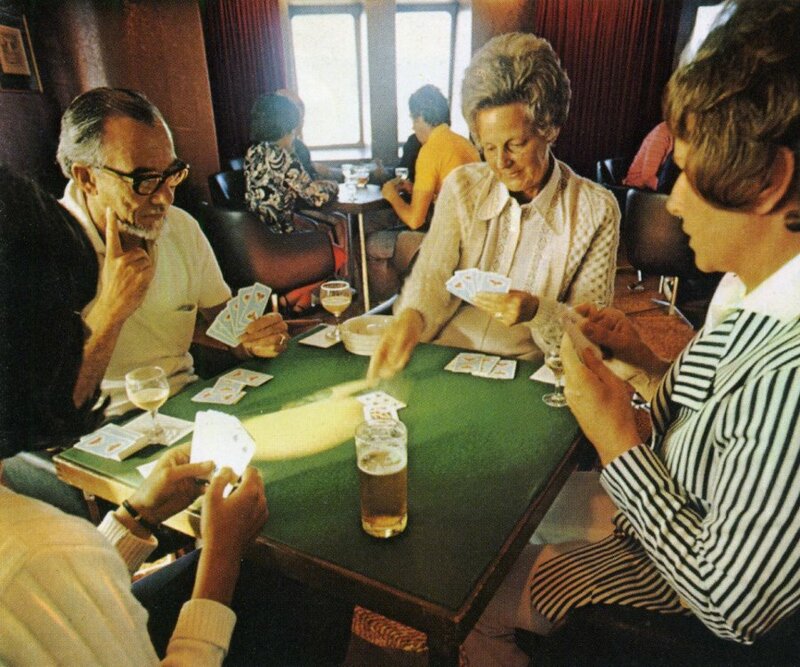 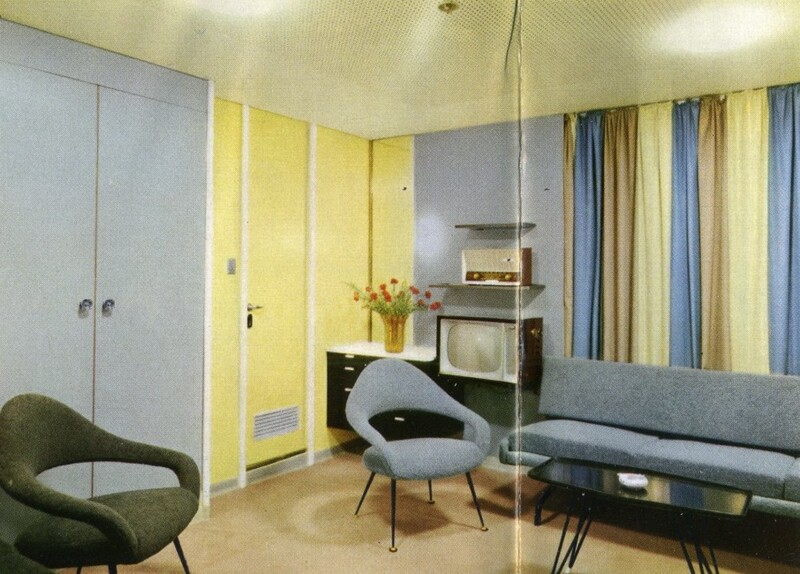 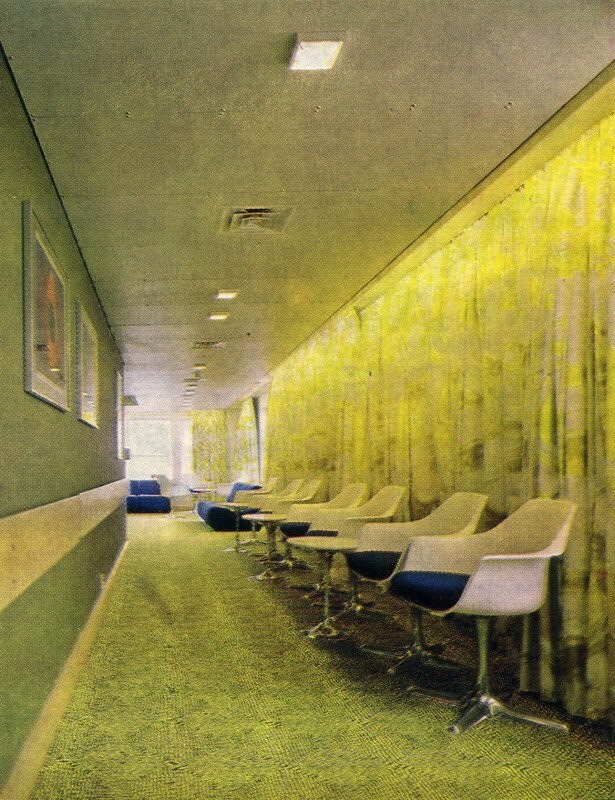 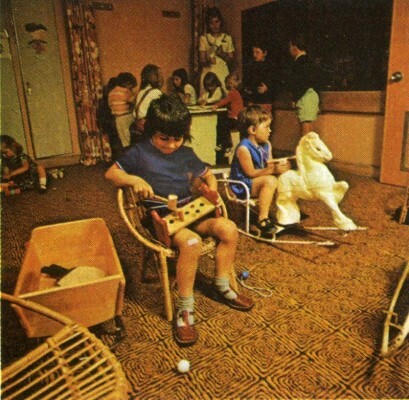 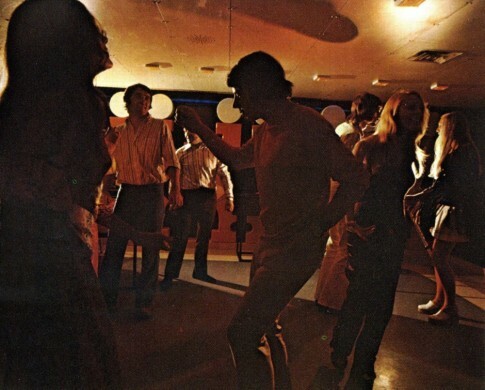 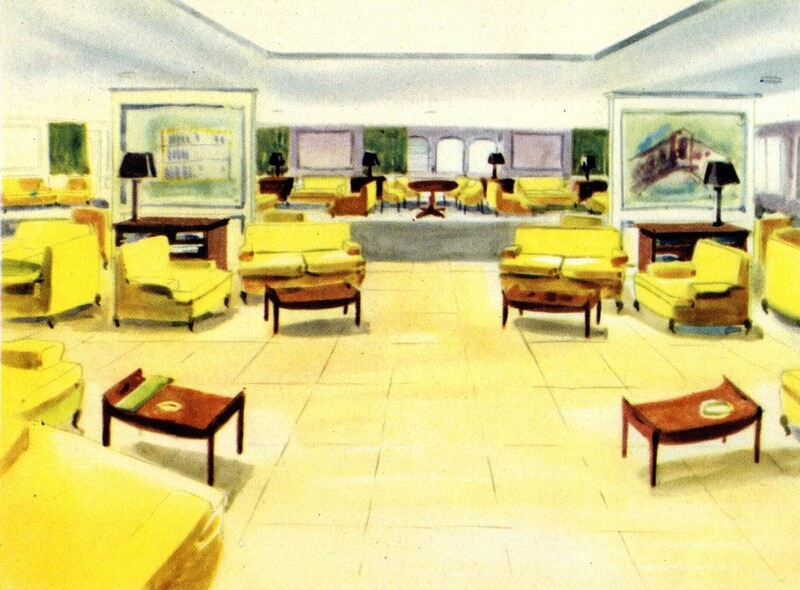 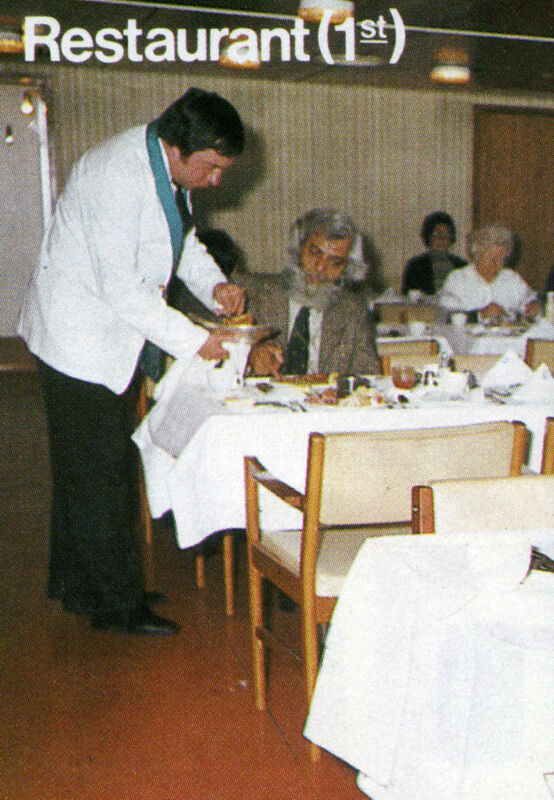 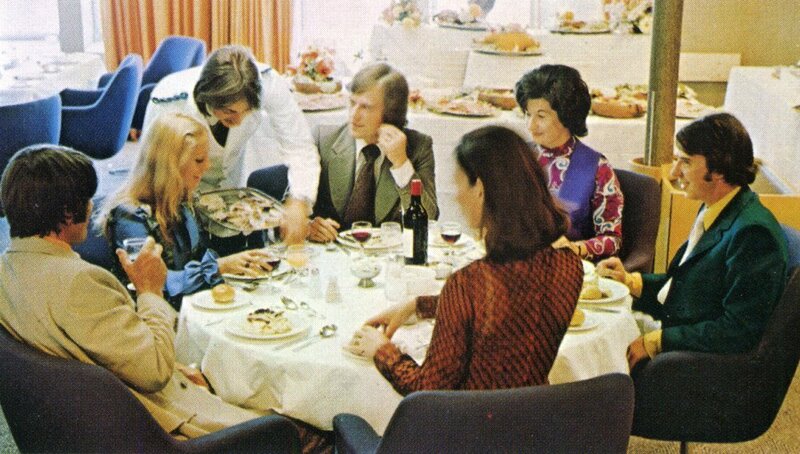 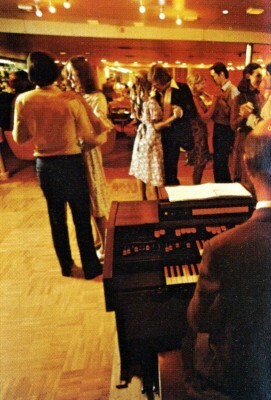 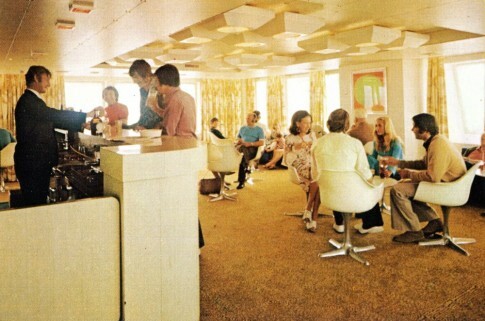 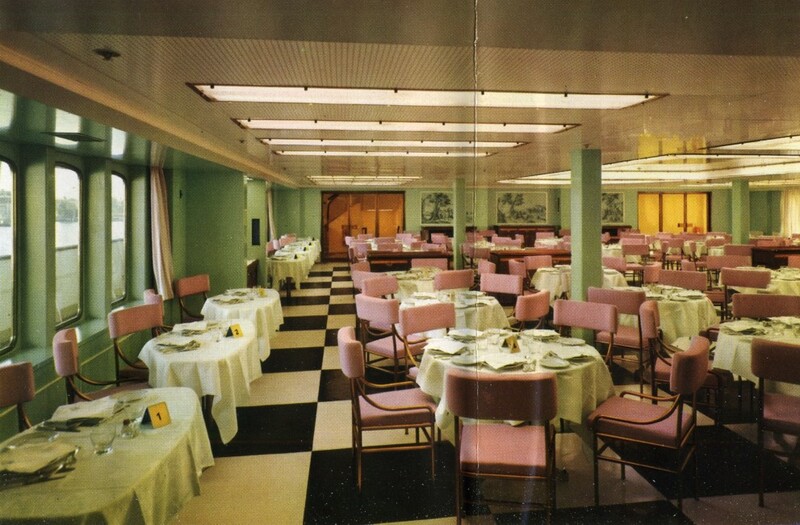 That decor was very slightly more staid than might have been expected had the Appia been built slightly further into the ’60s but it was not unattractive and the traditional Italian pegboard ceilings and polished linoleum floors could be found throughout. 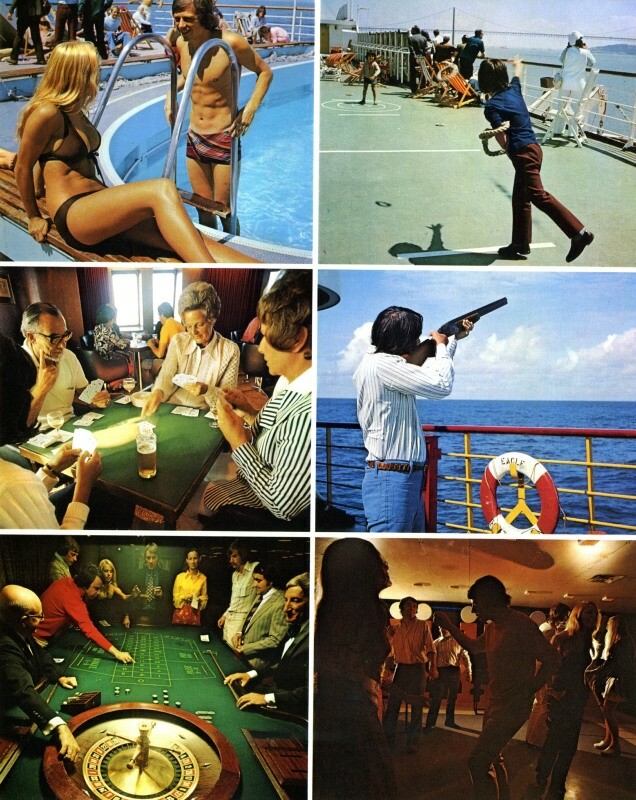 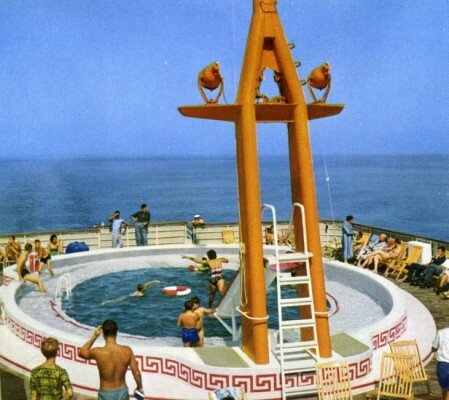 The ship’s nicely-detailed circular swimming pool featured an eminently photographable water slide which slotted in between a gap in the mainmast. 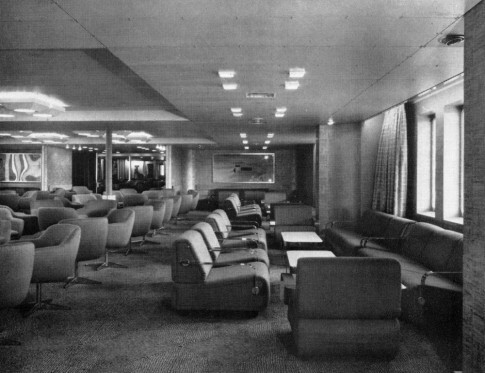 Cabin space was for just 200, the balance of her passenger load being accommodated on deck or in the various reclining seat lounges, the largest being located just beneath the bridge. 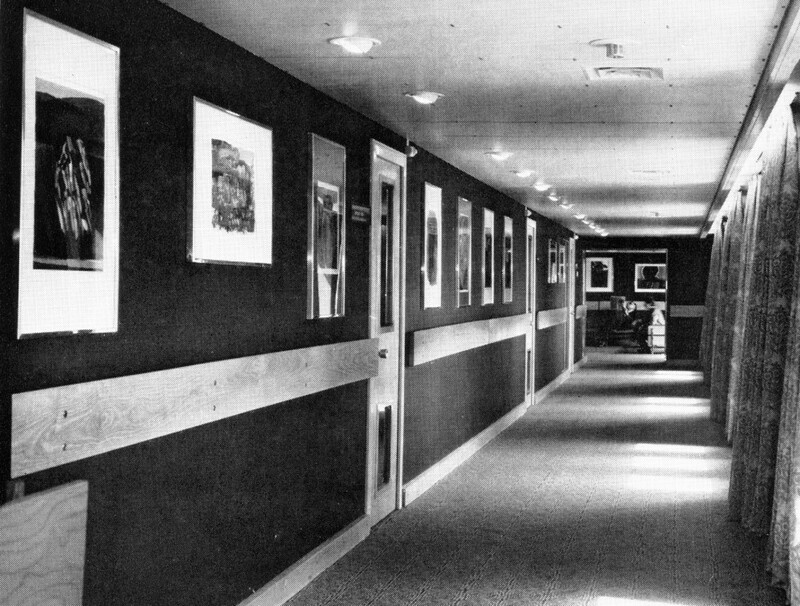 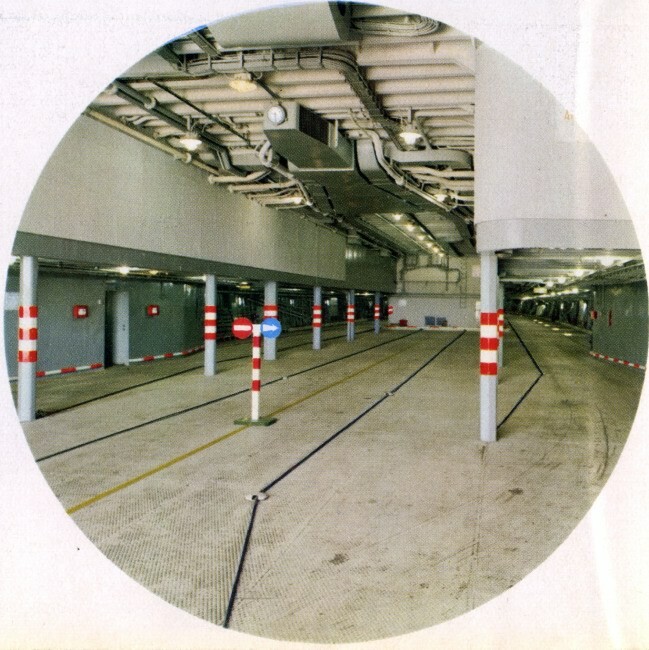 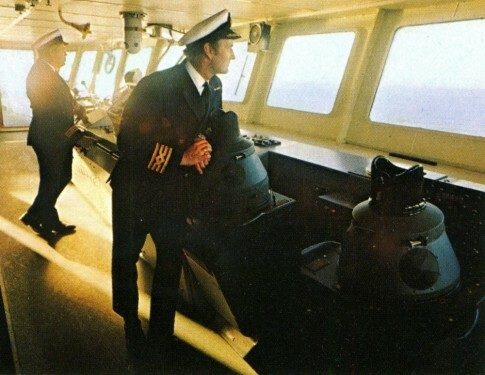 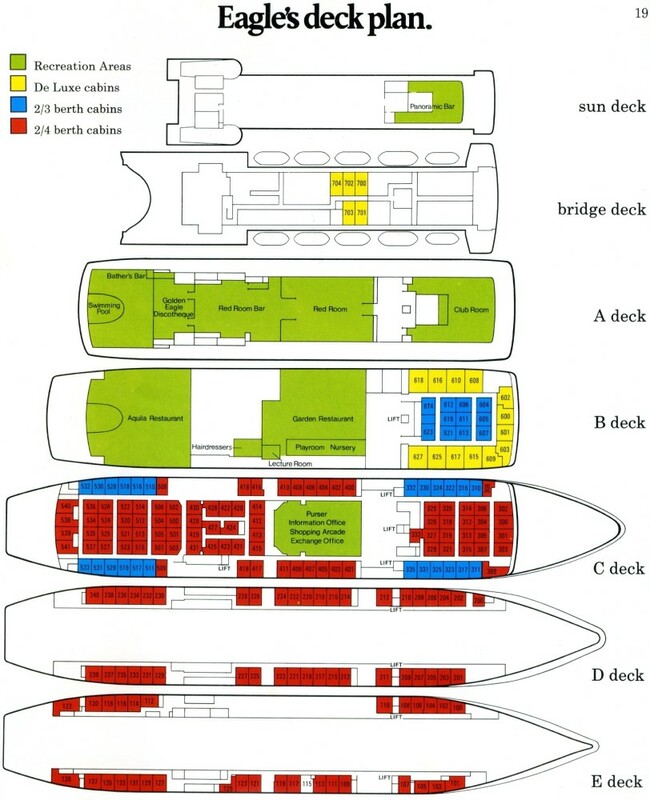 The relatively small vehicle deck (for up to 100 cars) had cabins running alongside at the upper level leaving a small centreline area astern for up to six coaches to be carried in an area aft of a very wide centre casing. 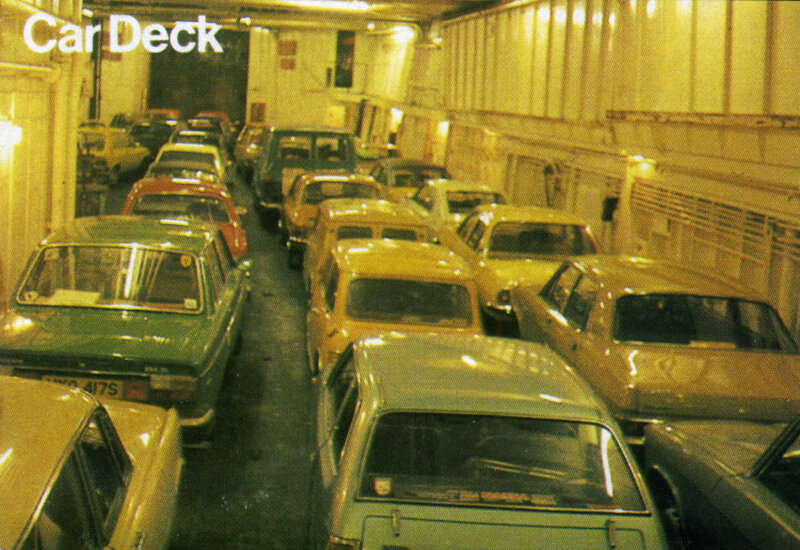 The ship's tightly-packed car deck, which would prove restrictive in the ship's later years. 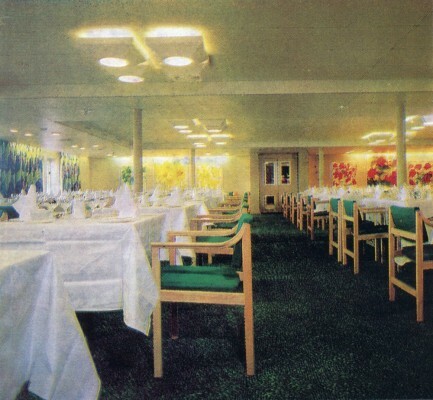 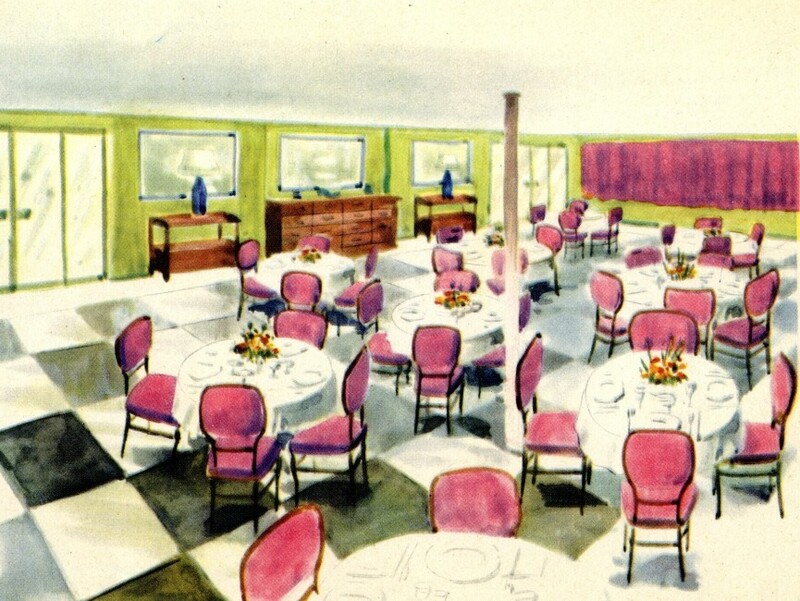 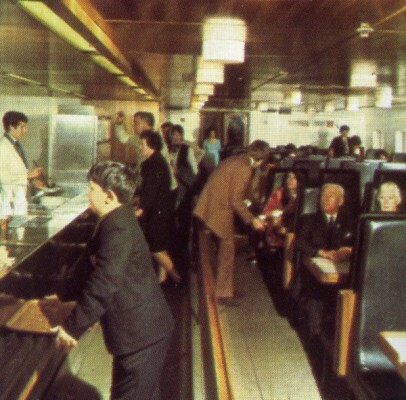 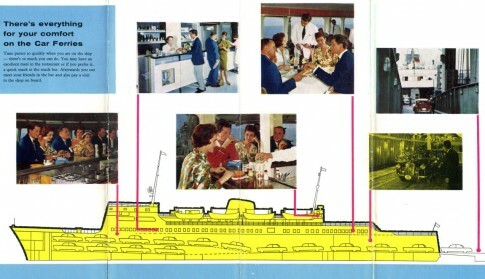 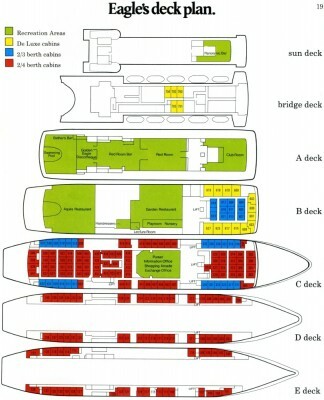 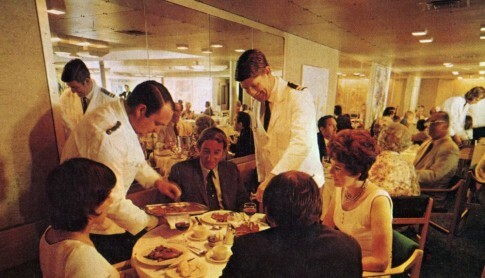 Astern on the lower of the main passenger decks, Deck C, was the main restaurant, as conceived (above) and completed (below). 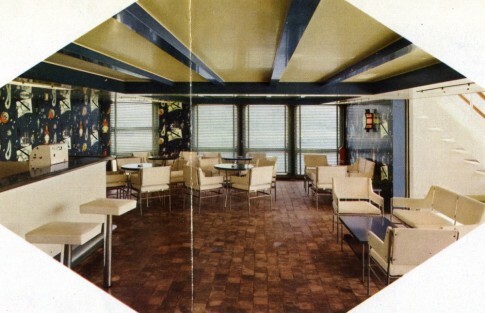 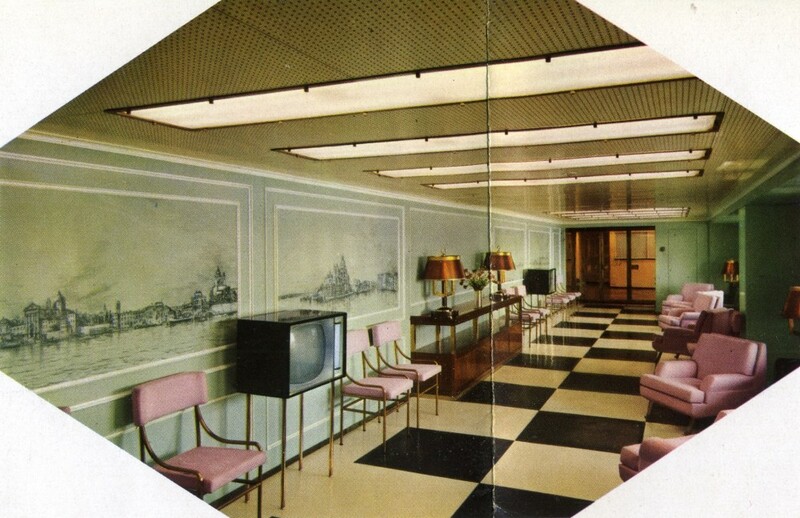 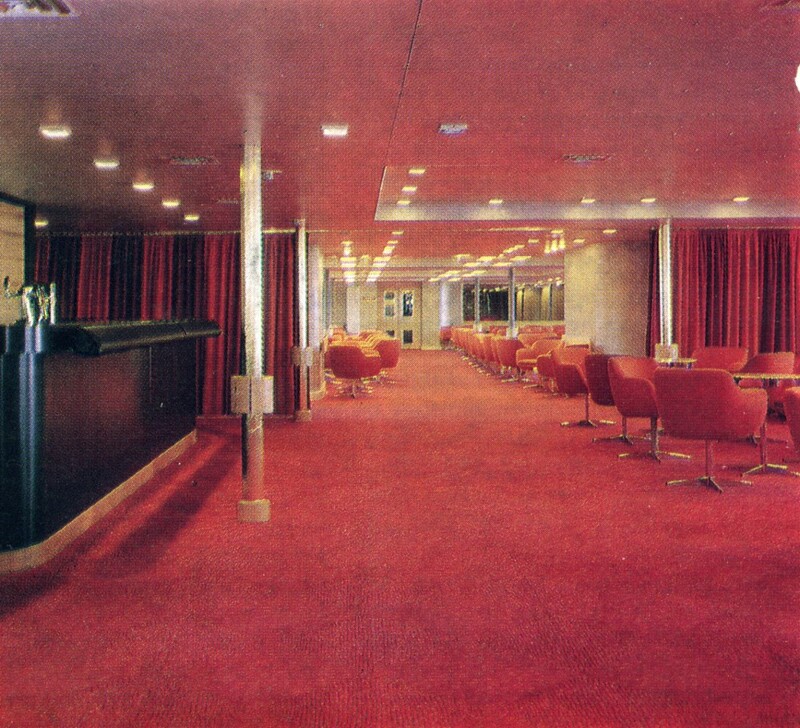 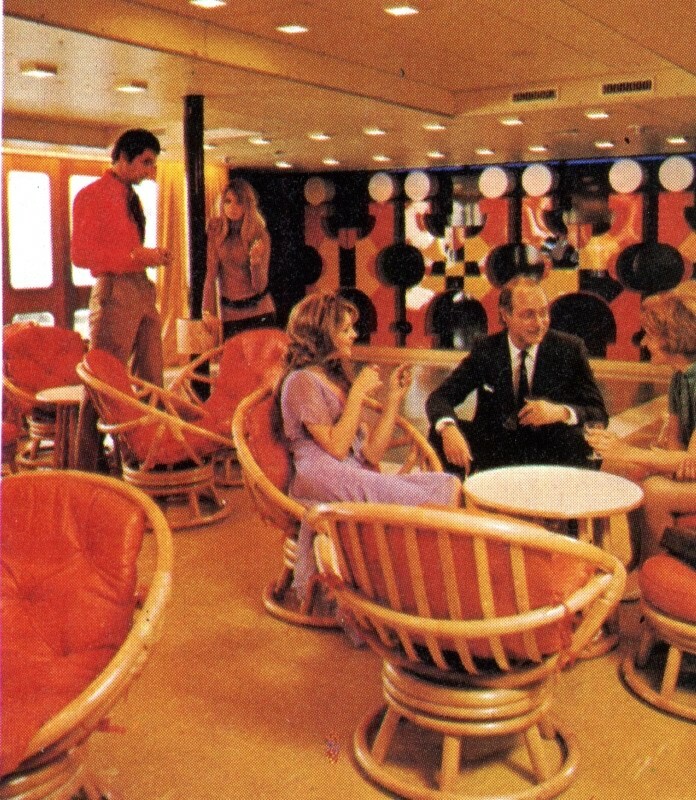 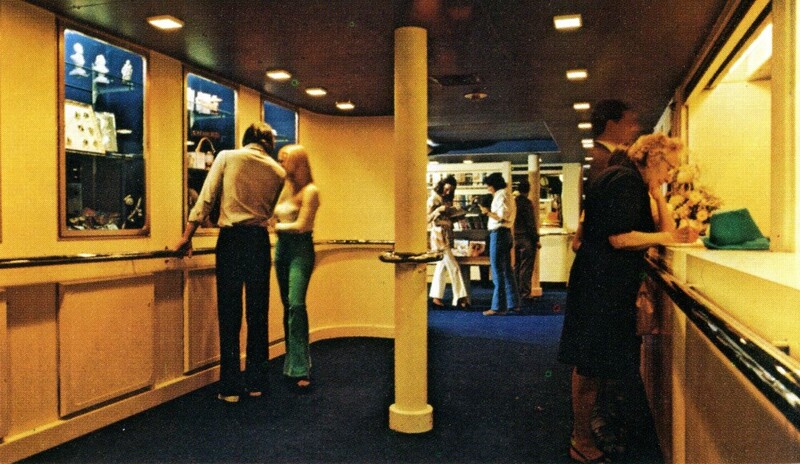 The restaurant was linked to the lobby, amidships, by this starboard-side arcade. 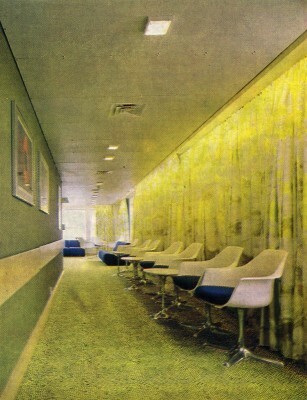 The main C Deck lobby. On the deck above, B Deck, forward was this large observation saloon filled with reclining seats. 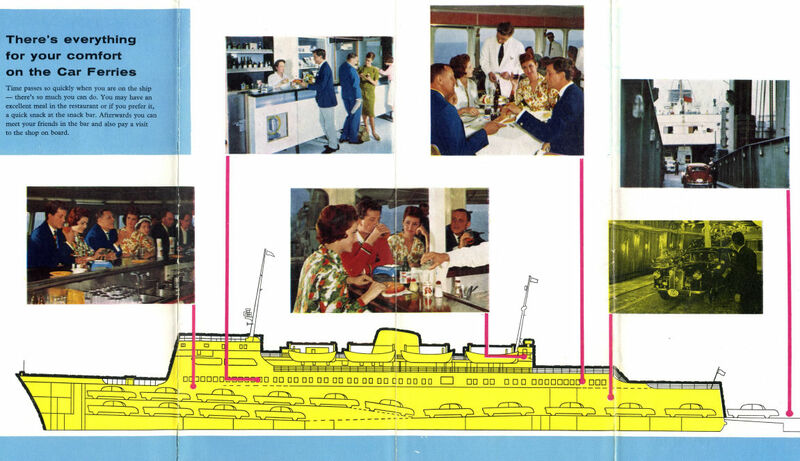 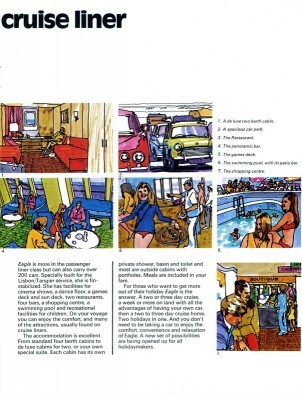 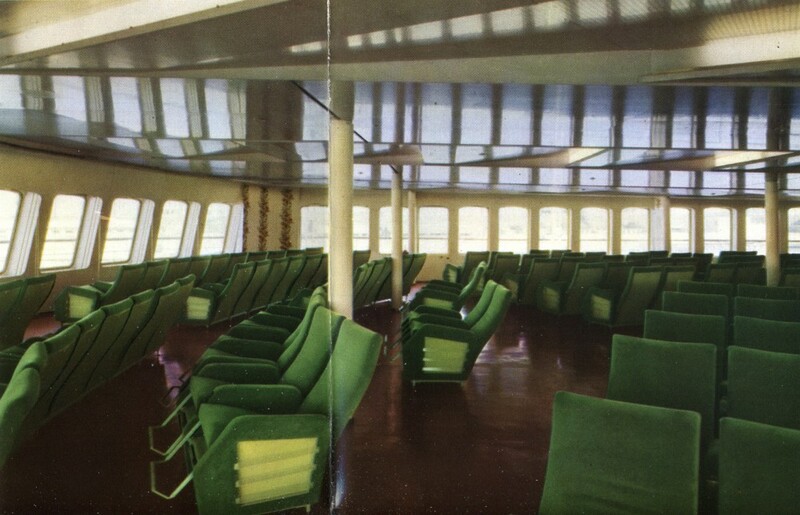 Astern on this deck was the â€œSala Soggiornoâ€ or Living Room, seen here as visualised in the inaugural brochure. The same area as completed. 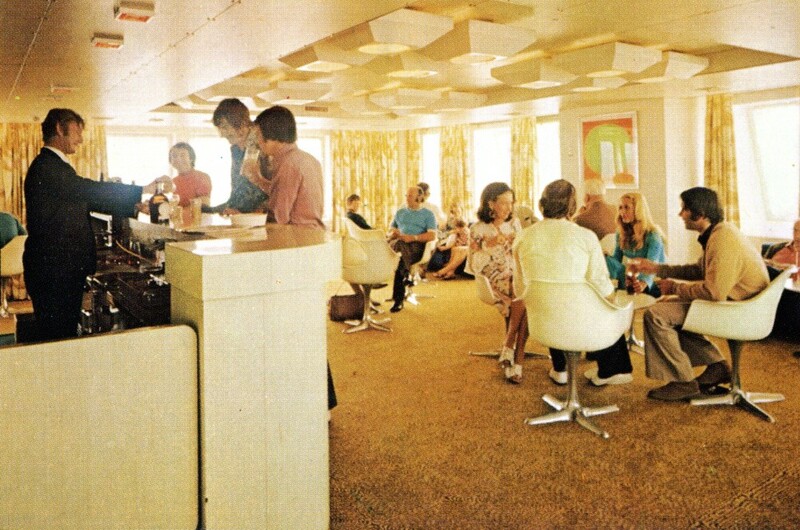 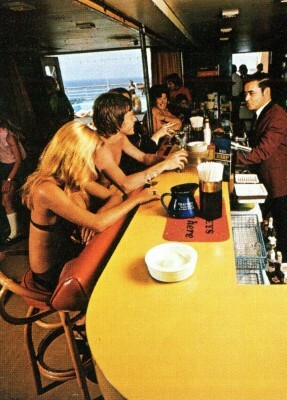 Aft on A Deck, the outside decks were served by this lido bar. 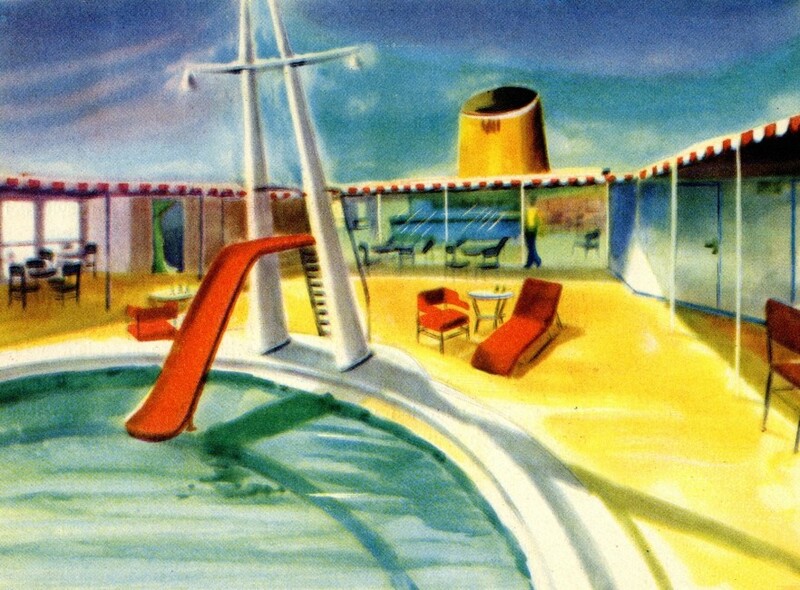 A pre-delivery image of the ship's shapely swimming pool and slide, aft on A Deck. 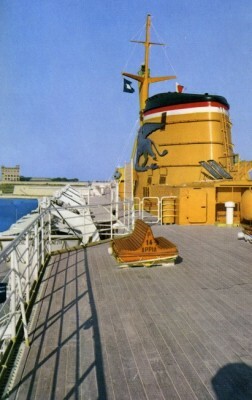 The pool in use mid-crossing. 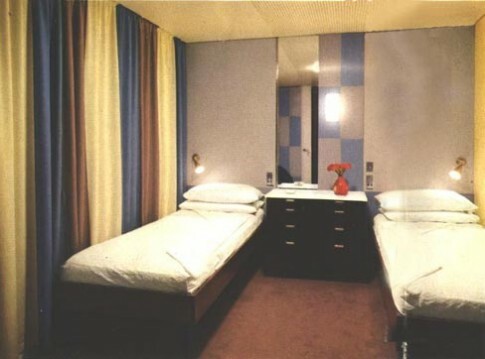 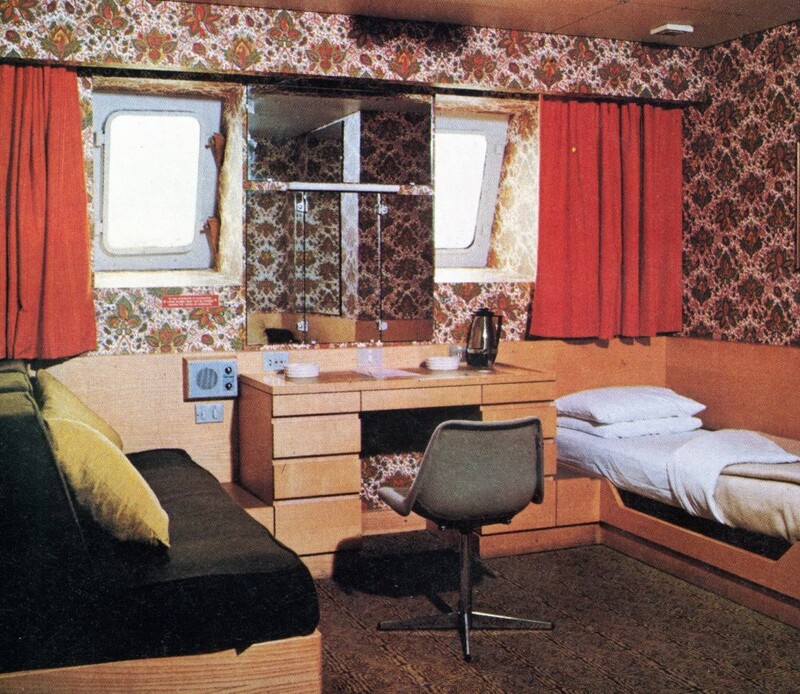 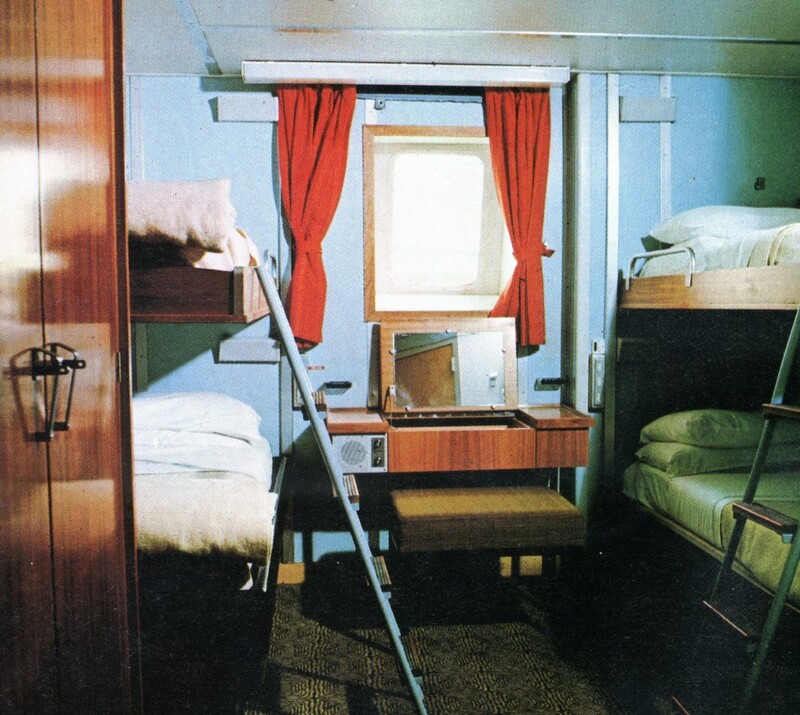 The ship offered seven 'Deluxe' two-berth cabins with private facilities including a full bath as well as one suite on C Deck, complete with private sitting area with TV and radio, as seen here. 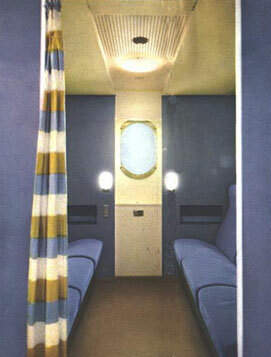 The sleeping area of one of the deluxe cabins. 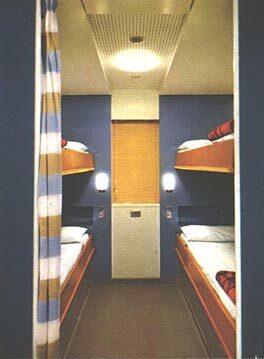 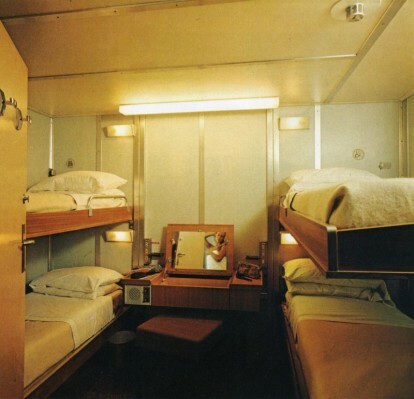 The bulk of the ship's cabin accommodation comprised Pullman-style rooms without facilities, which could be converted to night (above) or day (below) use. The Appia gave Adriatica loyal service for over 30 years, finally being sold to Indian interests in 1992 who briefly operated her as the Fibi before she headed to Alang for scrapping in 1995. 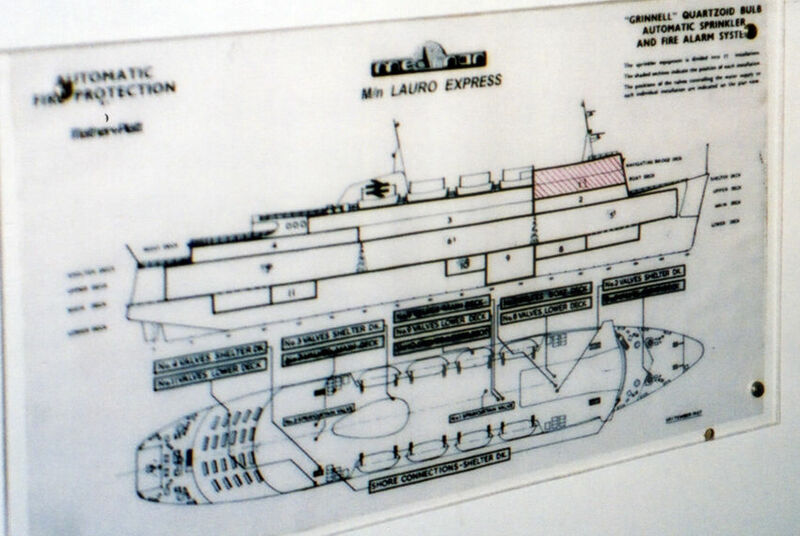 Her famous operators still had a few good years left, but their final conventional purpose-builds for the international services, the incredible trio of flops the Palladio, Sansovino and Laurana, were a dangerous warning sign that all was not well. Ships and time-honoured routes were quickly shed as the operation lost its independence and fell under a seemingly disinterested Tirrenia management in Naples. 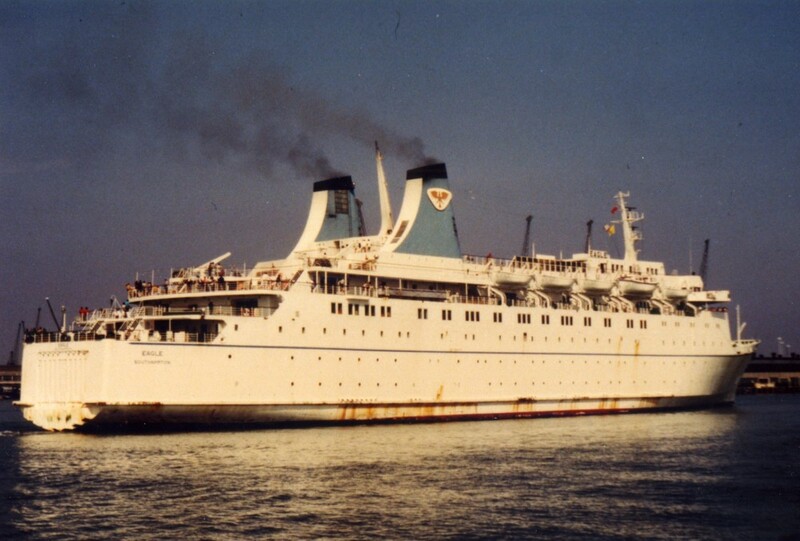 In 2010, the year in which perhaps Adriatica’s most famous ship, the ex-Ausonia, finally headed for scrap, there are further serious doubts about the future of the sole remaining service, from Bari to Durres in Albania, of what is now simply Tirrenia’s Divisione Adriatica. 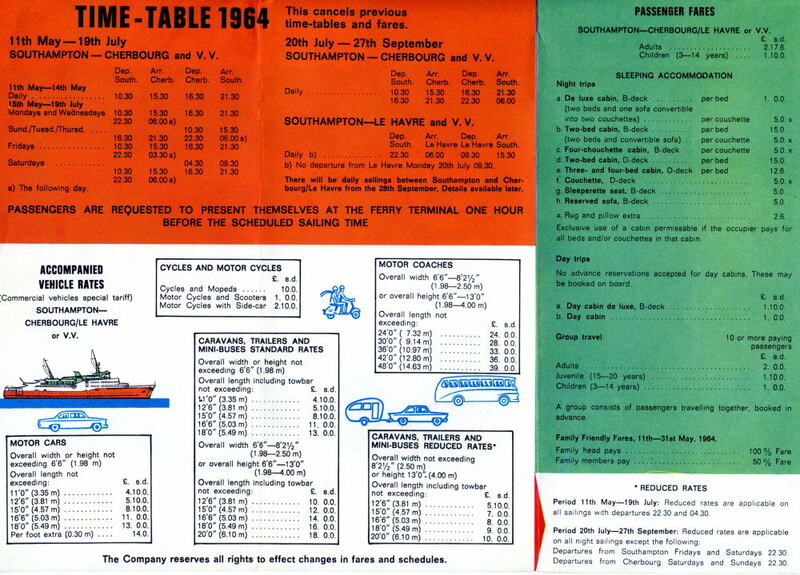 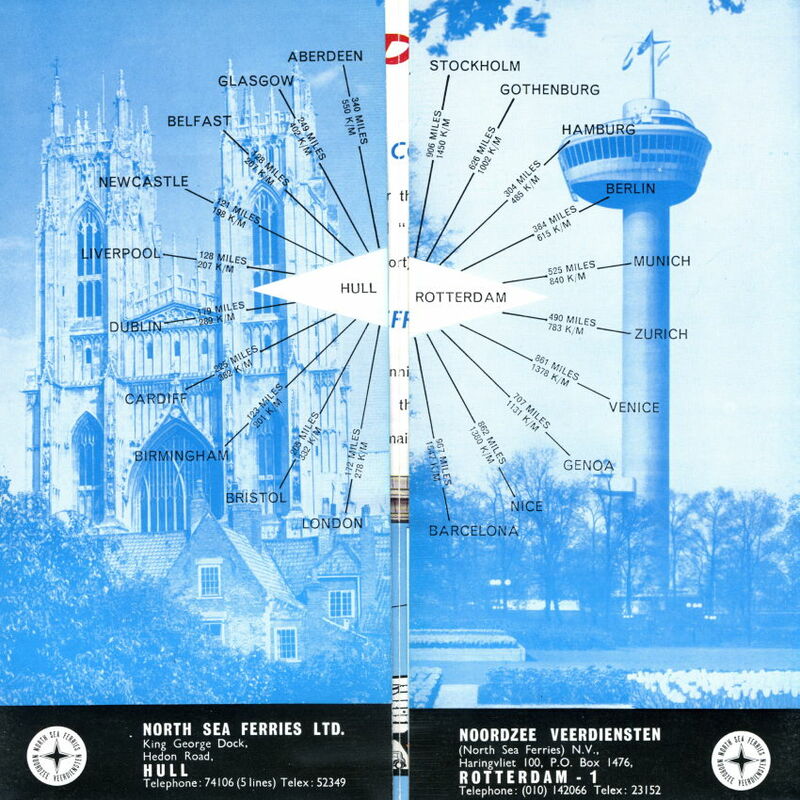 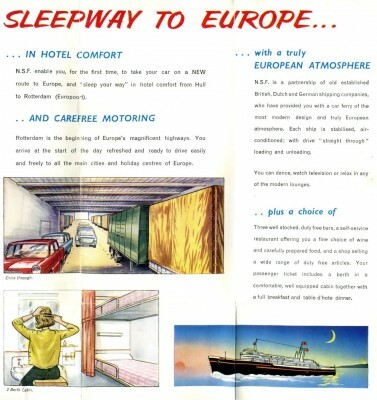 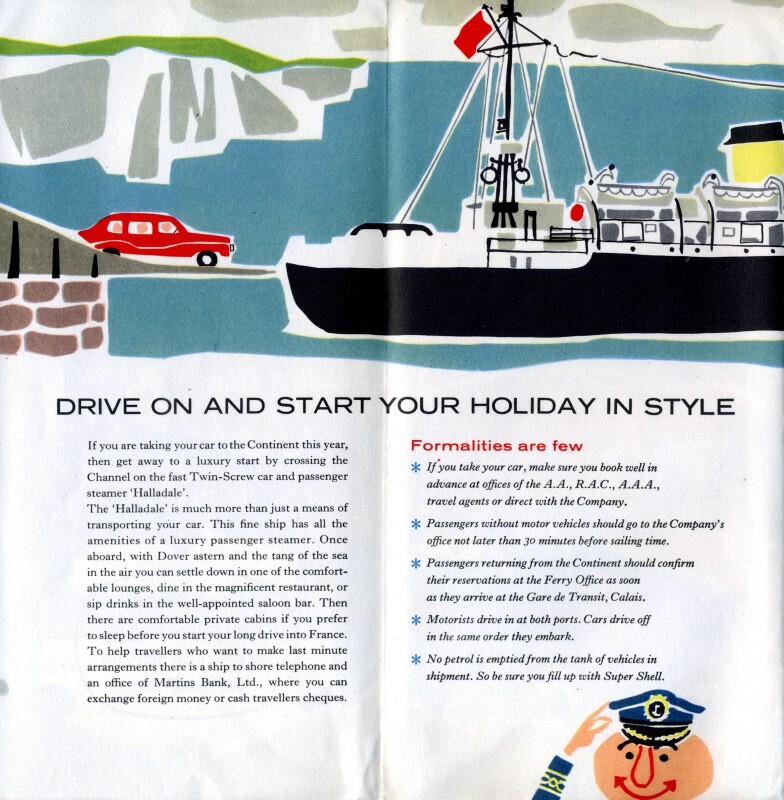 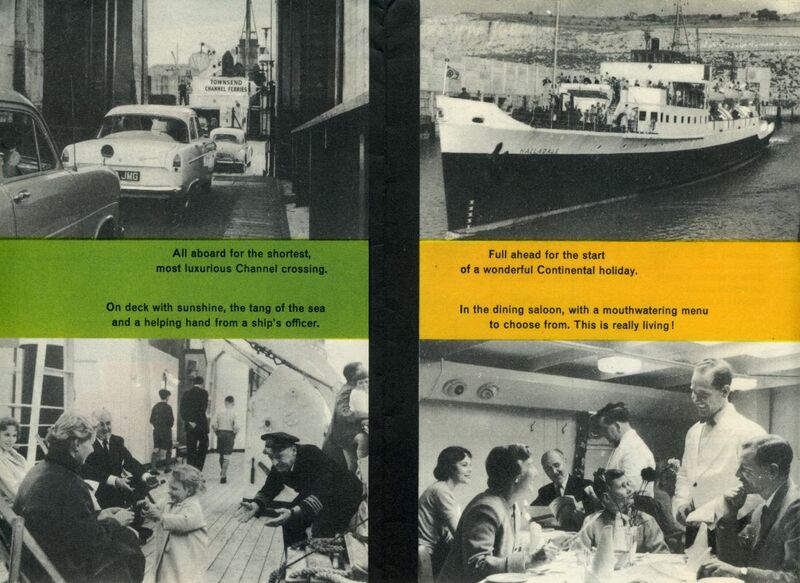 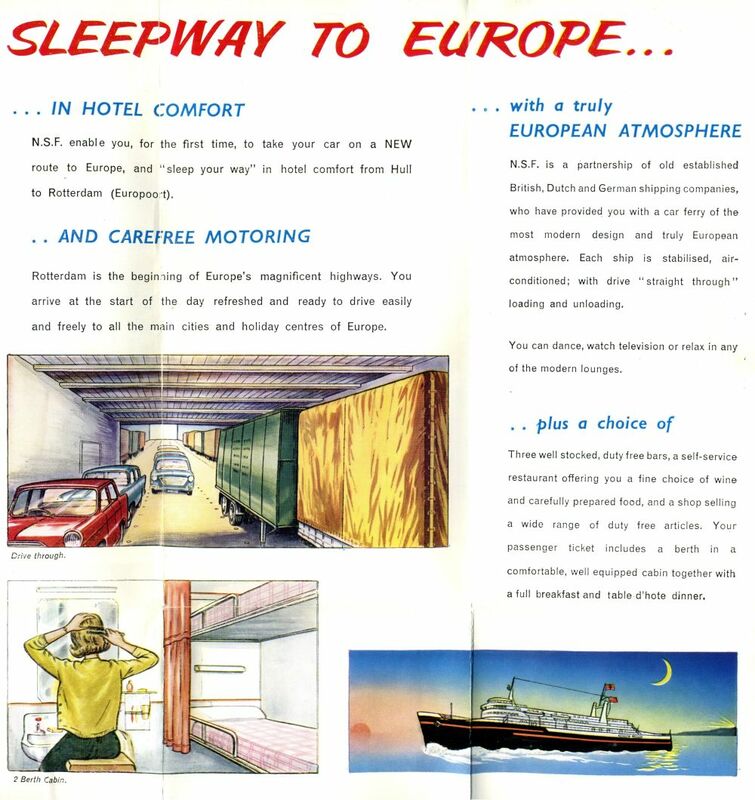 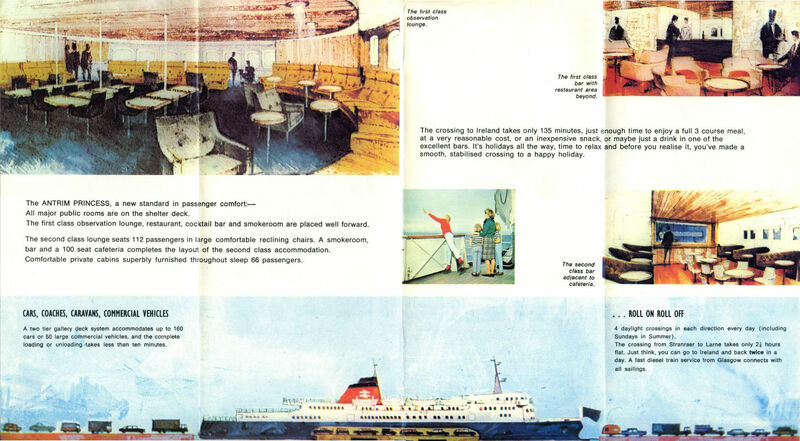 Having looked at the Viking I (the first drive-through ferry to serve Britain) and the Norwind/Norwave (essentially the first â€˜ro-paxesâ€™), our attention now turns to Townsendâ€™s Free Enterprise of 1962. 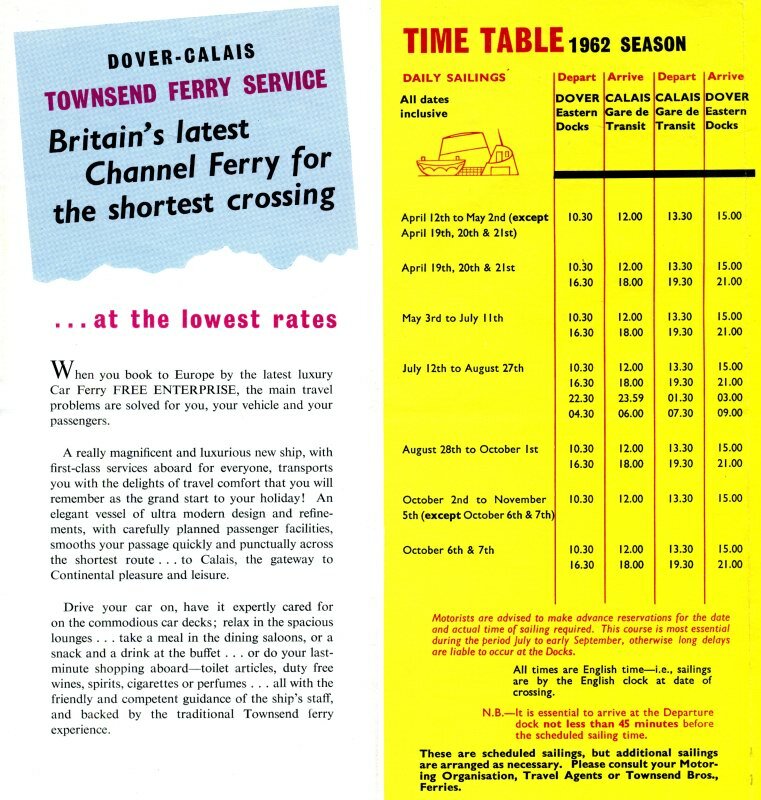 Townsend Car Ferries had been around since the 1920s operating, first, a converted minesweeper (the Forde) and after World War Two the Halladale, formerly a frigate. 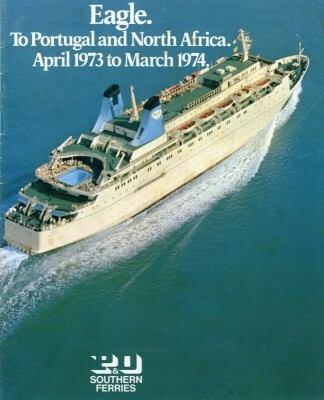 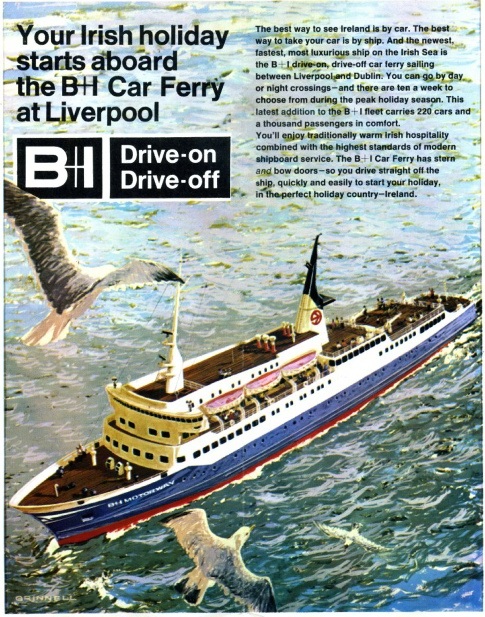 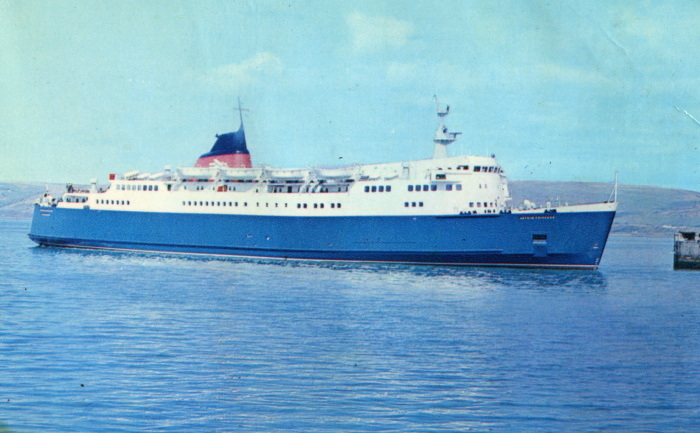 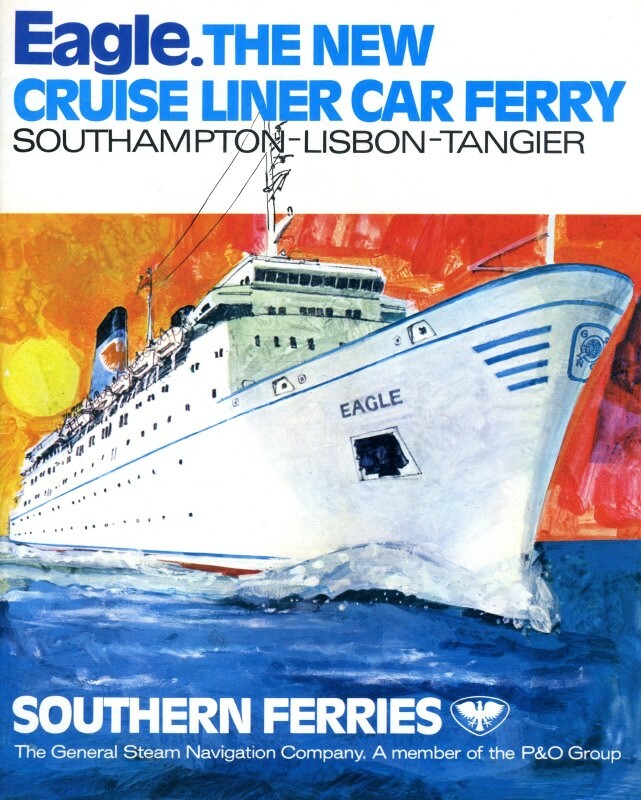 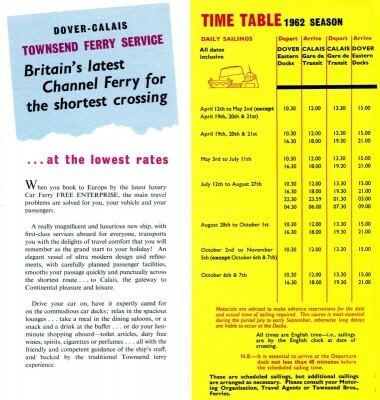 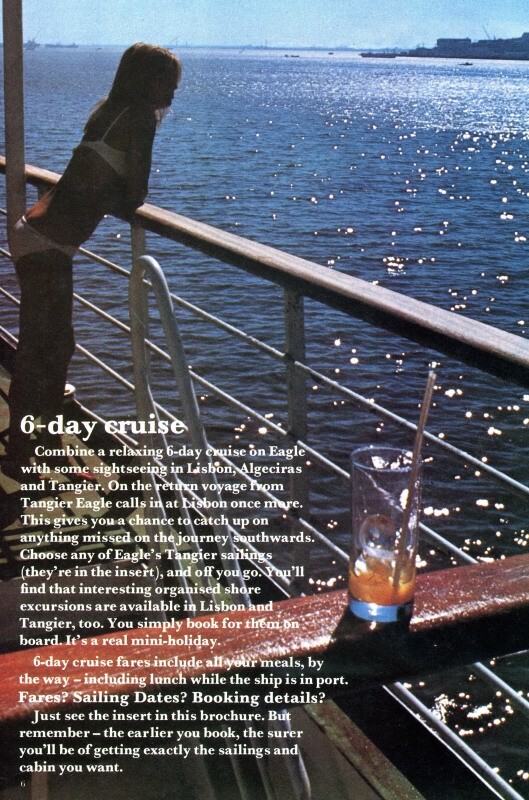 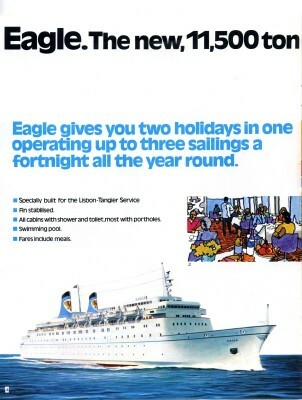 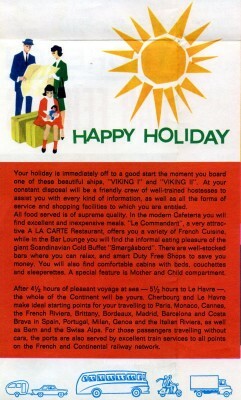 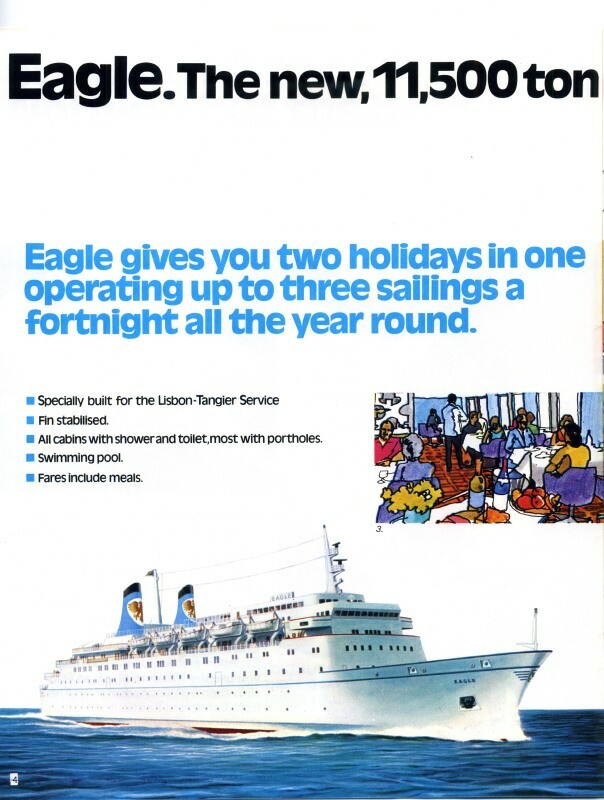 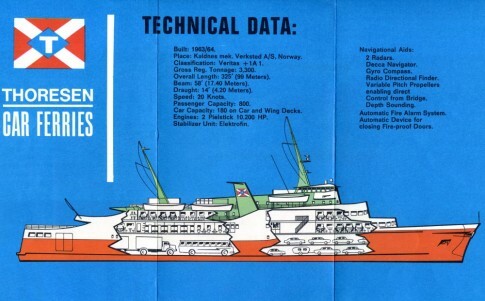 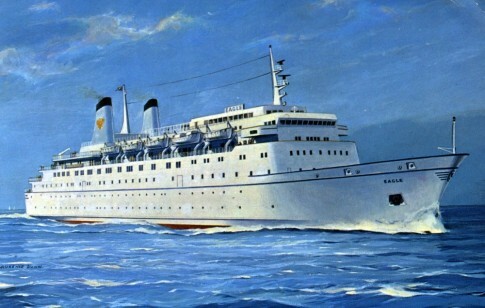 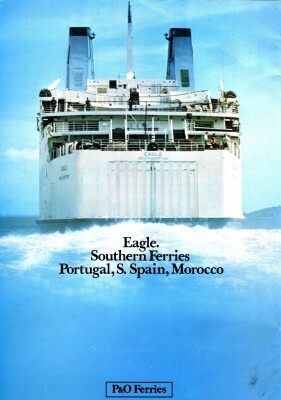 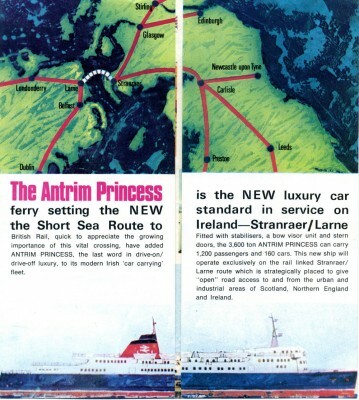 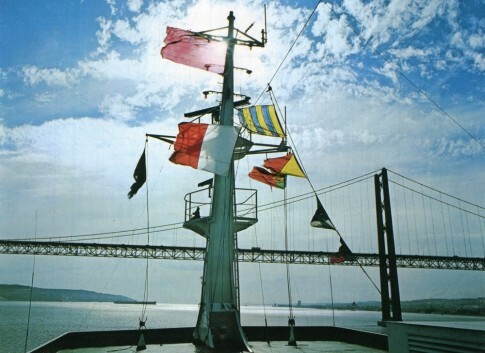 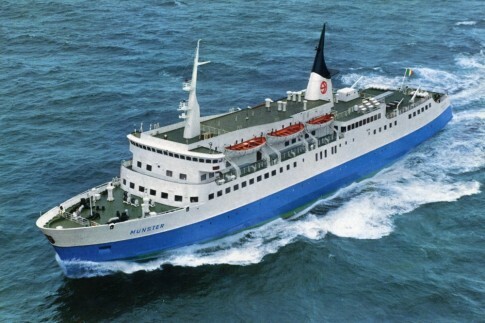 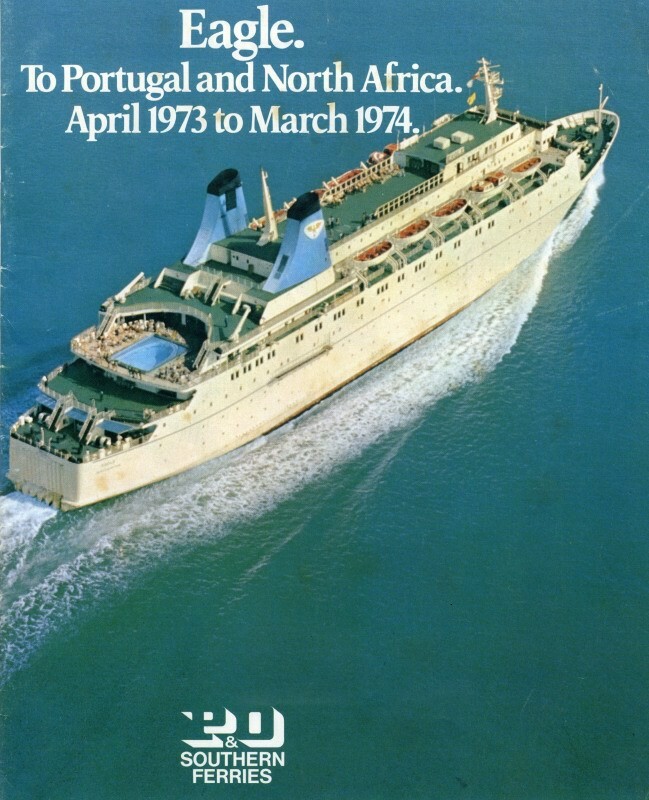 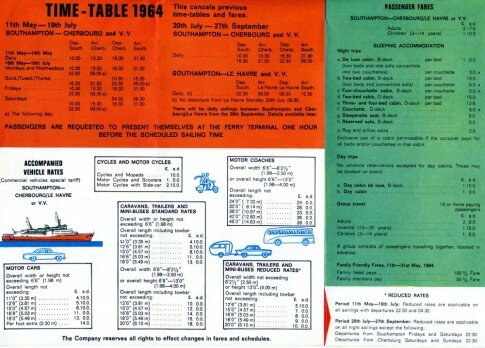 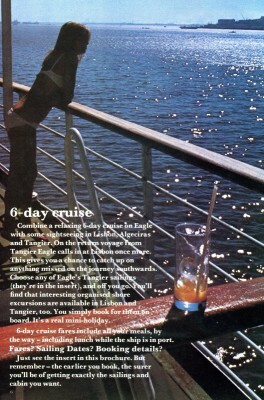 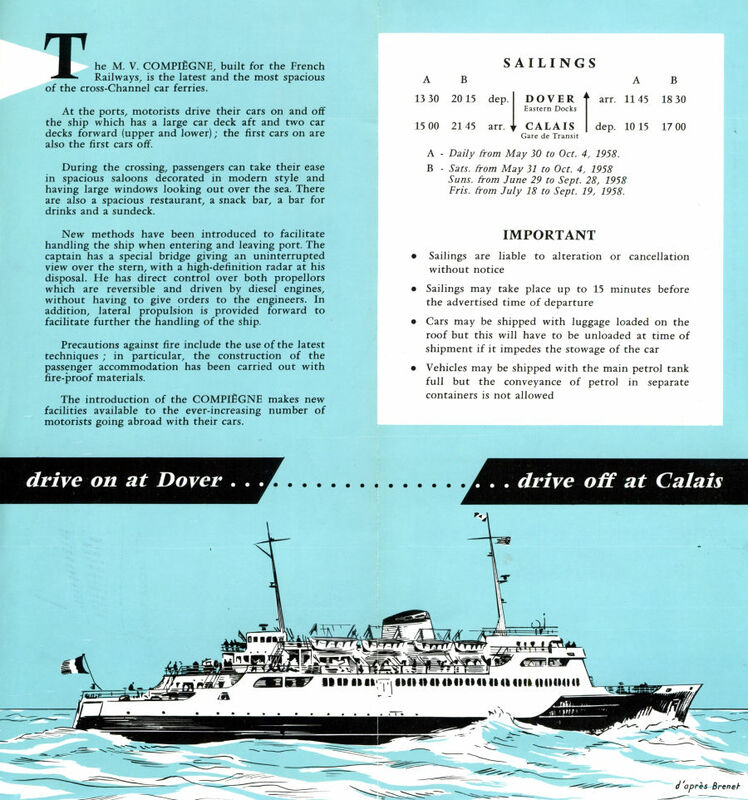 The Free Enterprise however was the companyâ€™s first purpose-built ferry and the differences between this vessel and those which had gone before were stark, as was highlighted in the 1962 brochure which offers an interesting comparison from an equivalent late in the Halladaleâ€™s career. 'This fine ship has all the amenities of a luxury passenger steamer'. 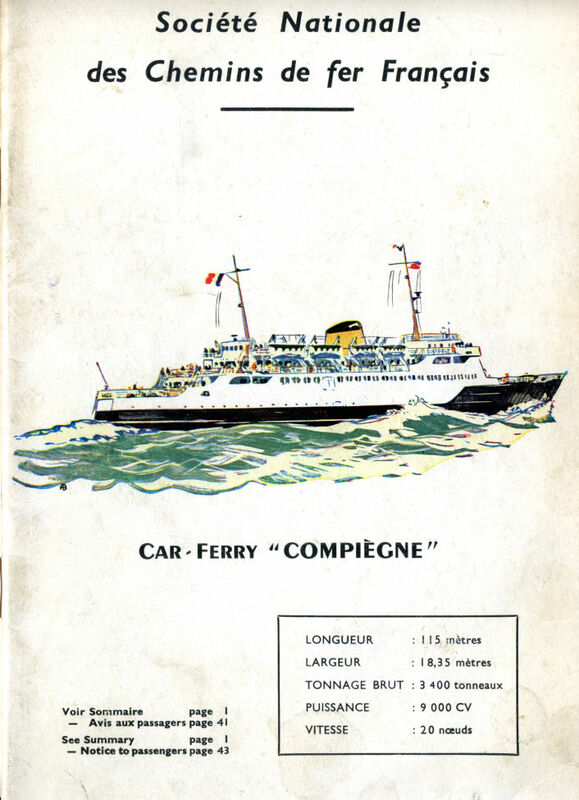 However the Halladale was hardly the Canterbury or even the Compiegne (introduced in the same year as this brochure, 1958). 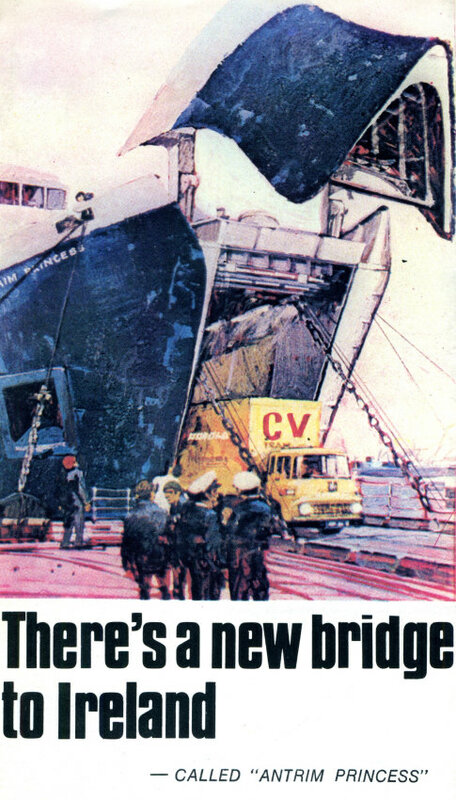 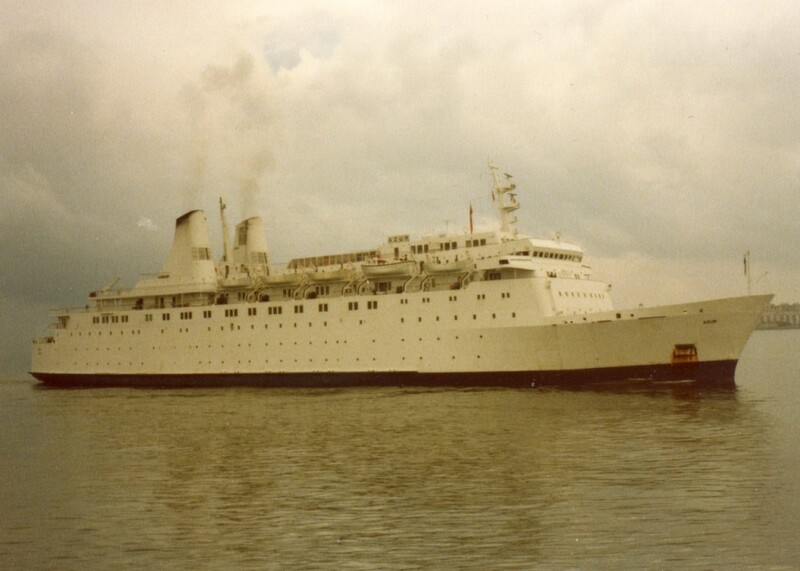 Carrying 850 passengers and 120 cars (against the Halladaleâ€™s 350 and 55 respectively) the new ship proved a massive success and Townsend were able to order a second vessel, the Free Enterprise II, the first British-registered â€œdrive throughâ€ ferry, which entered service in 1965. 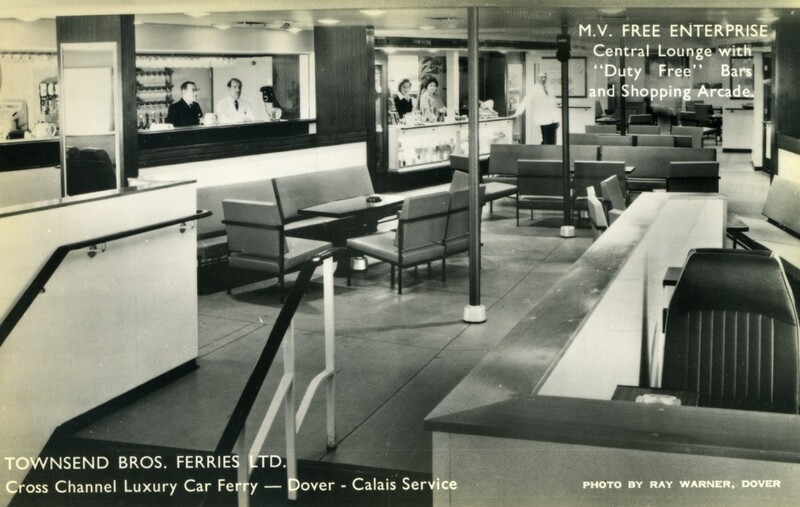 Further new ships followed, firmly laying the foundation for the leadership of the Dover ferry market that the companyâ€™s successors, P&O Ferries, retain to this day. 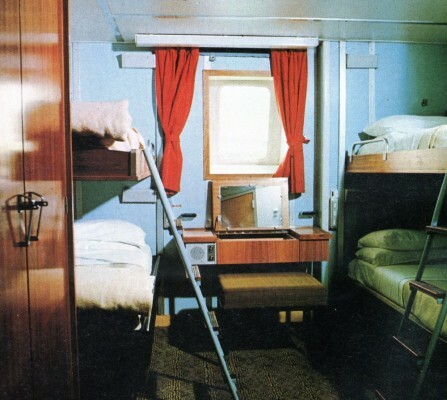 Despite the name, the opening season for the new ship was not exactly an example of marauding capitalism - one or two round trips a day was the norm, but this was pushed to four in the Summer peak. 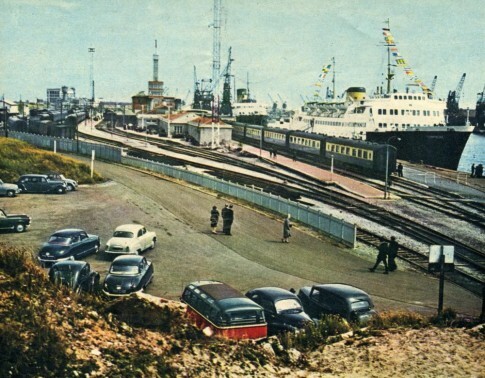 The 'rival' Dover-Calais car ferry, the Compiegne, only did four trips at Summer weekends, but the SNCF and Thoresen schedules were conveniently arranged such that when one ship was loading in Dover, the other was doing the same in Calais. 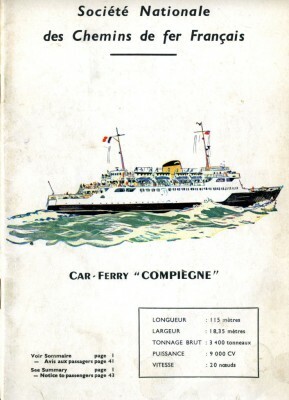 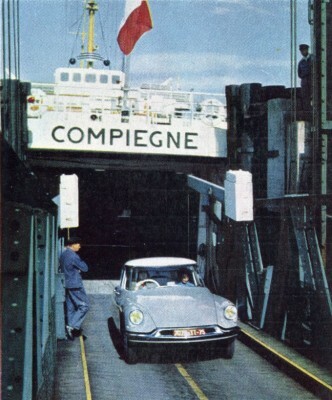 In terms of post-war Dover Strait car ferries it is however fair to say that SNCFâ€™s Compiegne of 1958 was perhaps the more significant ship in purely technical terms â€“ she was the first with controllable pitch propellers and bow thrusters although the â€˜FEâ€™ trumped her with a stern door headroom of over 15 feet compared to 12 feet on the French ship. The â€˜FEâ€™s significance for the British ferry scene however was perhaps in highlighting a trend that would become fast apparent through the early and mid-1960s: as her name proudly flaunted, she was owned by an independent operator, free from any governmental constraints to pursue the most profitable and logical design. 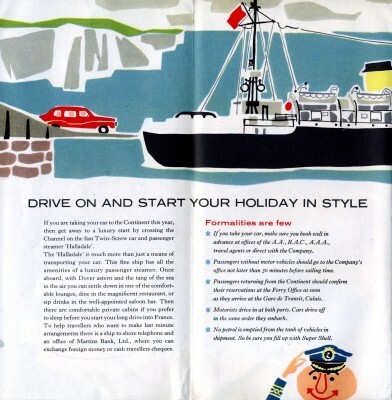 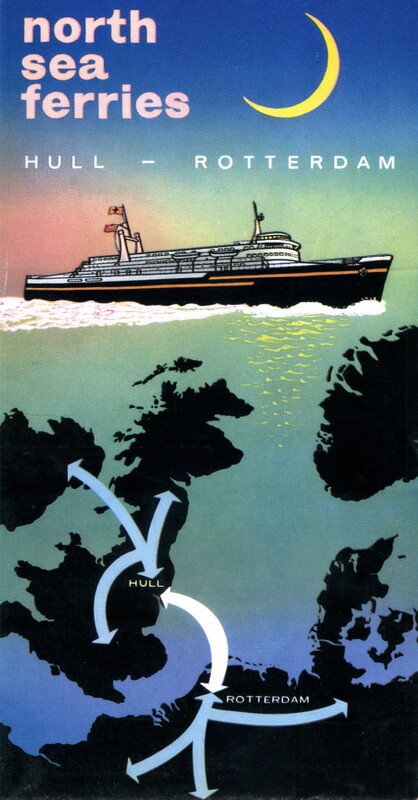 And, with free enterprise coming to the fore, it was the independent companies who would blaze the car ferry trail with genuinely modern new ships around the United Kingdom during this period â€“ Tor Line and North Sea Ferries on the North Sea and Townsend, Thoresen and Normandy Ferries on the English Channel. 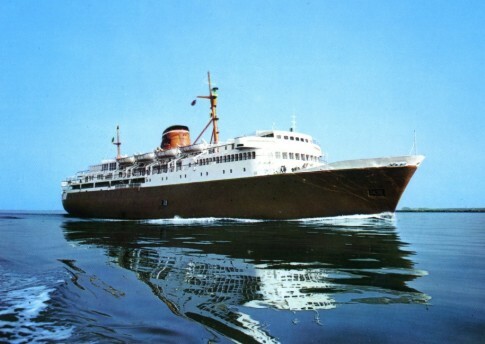 Remarkably, both the Compiegne and the Free Enterprise survive â€“ the French ship as a virtual hulk in Alexandria, Egypt whilst the ‘FE’ is today the Okeanis, laid up for a couple of years now in Elefsis Bay, after an abortive attempt to re-enter her latter trade as a Santorini-based day cruiser.